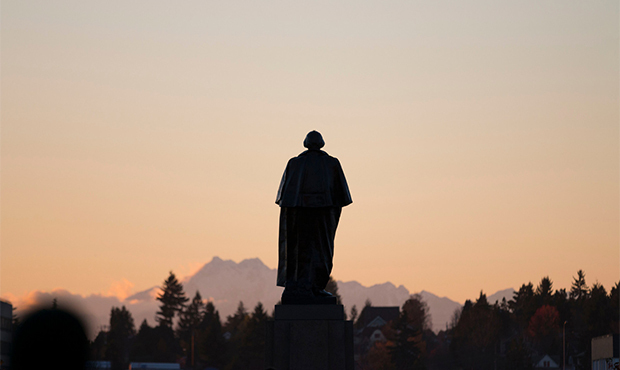 Donors contributed a record $564.4 million to the University of Washington in the 2017 fiscal year, breaking the previous record of $542.4 million set last year. The funds, secured through the University’s most ambitious philanthropic campaign in history, came in the form of private gifts and grants for student scholarships, faculty support, research projects and interdisciplinary programs. More than 154,800 donors helped the UW reach this new milestone, representing the largest number of donors in a single year in the University’s 156-year history. More than 80 percent of donors gave gifts of less than $500. Private gifts and grants supplement and enrich students’ educational experiences, fund scholarships, support research and capital projects, and benefit programs that serve the larger communities of Washington and the world. They do not replace core education funding provided through tuition and state appropriations. The funding represents a core element of the University’s campaign, “Be Boundless — For Washington, For the World,” that aims to build broad-based support for the UW and raise $5 billion by the year 2020. To date, the University has received $4.15 billion toward that goal. Two major commitments from The Bill & Melinda Gates Foundation announced over the past year are not included in the $562.7 million annual cash total because they will be funded in scheduled installments over the coming years. The foundation in January committed to invest $279 million to expand the work and impact of UW Medicine’s Institute for Health Metrics and Evaluation. The foundation also announced a separate $210 million commitment last October to support the University’s Population Health Initiative, a 25-year vision to improve health and well-being locally and globally, through construction of a new population health facility. Sizeable gifts this past year came from chemistry professor Larry Dalton and his wife, Nicole Boand, to establish a prestigious postdoctoral fellowship in the Department of Chemistry; Paul Allen and Microsoft Corporation to establish the Paul G. Allen School of Computer Science and Engineering; and gifts from Amazon, Microsoft, Zillow, and local philanthropists Charles and Lisa Simonyi to construct the UW’s new computer science and engineering building. Damond Lai’s parents grew up without electricity in Cambodia, and now the UW undergraduate is studying electrical engineering to improve people’s lives using innovative technology. Support from the John and Laurel Coltart Endowed Scholarship is critical to helping Lai, the son of refugees and a first-generation college student, pursue his ambition to be an electrical engineer. Washington Research Foundation, in partnership with the UW’s CoMotion, supported 19 teams in engineering and the life sciences that developed innovations with a high chance of impact, but unlikely to get there without additional funding. This year’s winning projects include a way to measure pollution in the air, drones to survey companies’ inventory and increase efficiency, and natural microbes to enhance agricultural crop production. Through a gift from Bill and Beatrice Booth, the College of the Environment is replacing the antiquated R/V Barnes with a newer vessel that can access marine and fresh waters around Washington. The UW is only the second university in the U.S. to acquire a new research vessel because of private support, and is now positioned to offer immersive research experiences to more students. Scientists and students from community colleges, businesses, agencies and tribal communities will have the opportunity to join on research excursions throughout Puget Sound, along the coast of Washington and up the Columbia River. Columbia Sportswear President and CEO Tim Boyle and his wife, Mary Boyle, gave to grow the Husky NightWalk zone and improve campus safety. The Boyles are parents of UW alumni, and they wanted to expand the program to residential neighborhoods where many students live. The Founders Endowed Fellowship at UW Bothell was established in 2004 to support undergraduate research. One of eight winners last year was Federico Pastoris, who spent summer and winter break in Nicaragua and Guatemala researching ways to alleviate indoor air pollution caused by burning charcoal and wood. The Bill & Melinda Gates Foundation supported the College of Education’s EarlyEdU Alliance. Launched by the UW last year, EarlyEdU was created to offer high-quality preparation for the nation’s early education workforce. Nearly 50 higher education institutions, many of which serve poverty-impacted and underserved communities, are members of the alliance. Gifts from the Gritman Medical Center in Moscow, Idaho, have established two scholarship funds to support UW medical students from Idaho interested in returning to the state to serve as family-practice physicians in rural areas with high need. Mitch August Aman, a UW senior, is the first recipient of the Class of 2016’s endowment awards. Aman is creating a free online clothing exchange for transgendered youth and young adults, particularly those whose parents do not support their transition. The UW’s Global Opportunities Fund increases access to transformative study abroad experiences for students with financial need. This past year, more than 180 undergraduates studied abroad with the support of a study abroad scholarship. John and Laurie Tangney, UW alums and parents of alumni, pledged to the Champions Program that helps students who were part of the foster care system succeed at the UW. The Milgard School of Business at UW Tacoma received a significant lead gift from the Whisper Foundation and the Ruth Foundation to support its efforts to build a state-of-the-art Professional Success Center. Both foundations are part of the Gary E. Milgard Family Foundations. The center will leverage already strong support from the business community and alumni to develop a one-stop shop for students to explore majors and career paths, enhance their professionalism, pursue co-curricular opportunities such as internships, and achieve job and career aspirations. Donald C. Hellmann, a professor in the Jackson School of International Studies and Department of Political Science, has taught at the UW for over 50 years and was instrumental the formation of the Jackson School and its senior capstone: the Task Force Program. An anonymous donor has made a significant gift that will allow the school to support this program in perpetuity, specifically recognizing Hellmann’s role as a dedicated teacher, institution builder and the creator of the capstone program. Donors gave more than $358 million to enhance faculty and student programs and support. About $55 million was contributed for capital funds. The remaining gifts went to department-level excellence funds, which support publications, student award programs, speakers and special projects. Note: This post has been updated to reflect the final fundraising total and number of contributors, from $562.7 million to $564.4 million and from more than 150,300 donors to more than 154,800.